Two Southampton supporters have been arrested following their 2-1 defeat to Cardiff City on Saturday for making aeroplane gestures, mocking the recent death of Emiliano Sala, the Argentine striker the club bought for £15 million from Nantes before he tragically died in a plane crash in January. 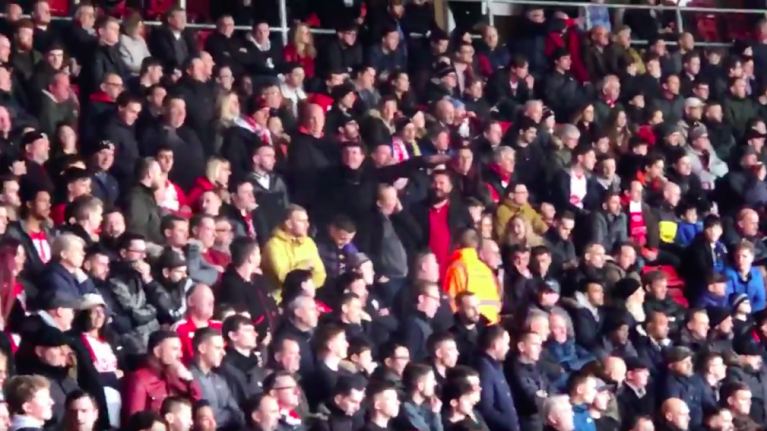 The two men were ejected during the game by the stewards at St.Mary's stadium after they were spotted repeatedly making plane gestures towards the away end. However, it has since transpired that the men have also had their details taken by Hampshire police after being detained and now face a three-year banning order from attending Southampton matches. A Southampton statement read: "Southampton Football Club can confirm that two fans were detained and had their details taken by police during our match against Cardiff City on Saturday. "Such behaviour has no place in our game and will not be tolerated at St Mary’s. The club will be taking an extremely firm stance against anyone involved and intends to ban those supporters identified." All teams in the Premier League wore black armbands as a tribute to Sala and there was a minute silence before the kickoff at St.Mary's. Cardiff supporters wore daffodils and sang his name throughout the game, which they won 2-1 thanks to a last-gasp winner from Kenneth Zohore. Afterwards, Cardiff manager Neil Warnock dedicated the win to Sala: "We wanted to do it for Emiliano and I'm really proud the lads have done him justice."